For this we need to have docker in our PC. So, how to install docker in Ubuntu PC , you may see from previous post. For other platform, you may follow this. I will follow simple steps, to do. The plan is to have two different containers running influxdb and grafana and when we run Jmeter, this actually storing results in influxdb and grafana dashboard is showing. Now, to know more about grafana dashboard configuration or influxdb configuration, i request you to read my this post. I am not using default influxdb container as we will use our own configuration files to run with. What I did here ? 4. Download, install & remove influxdb installer. 5. Expose our necessary port(see my this post for knowing about default port) which will work with localhost. 7. Putting CMD command so that when container will run, this command can run influxdb with our given configuration. Step 3 : create a configuration file(influxdb.conf) or you may copy from my this post or from repository. 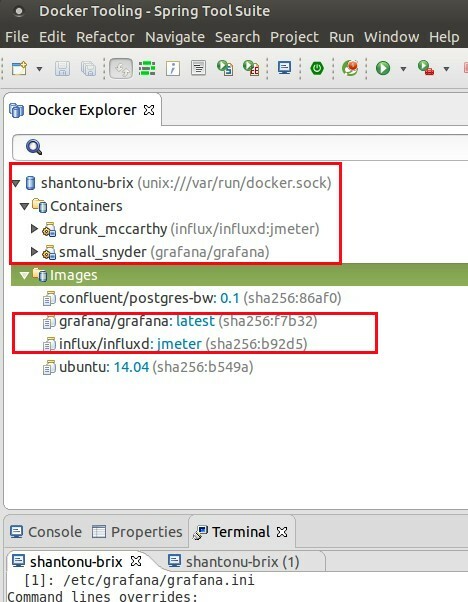 docker build --tag 'influx/influxd:jmeter' --no-cache=true . if you dont add this file, you have use this command for building. Now, check influxdb like following my this post. Step 3 : Make a file gr.sh (entry point file, mentioned in Dockerfile) and put this inside. you can see, it only executes grafana server with defined path. Step 4 : Make a file GRAFANA_VERSION with no extension(used as argument in Dockerfile) , edit with latest version of grafana, like this. Step 5 : Make a file build.sh which actually contains build instructions (like as influxdb) following this . You can see, it is checking version and if not found, will download from docker remote registry. Step 6 : Make a file run-grafana-docker.sh to run this container with this commands. For the first time it will download and install and after that everything is okay. Now, check grafana like following my this post. You need to login, add database and organize dashboard for jmeter monitoring. Jmeter-Grafana docker Live monitoring : This was my settings like as my this post. And, if you run jmeter, you can check them in dashboard. Again for dashboard configuration, use steps from my this post. 6. Grafana password , default admin admin. My Both docker resources are in this repository. I put an extra influxdb configuration "configure.sh", in case you need manually configure for db initiation.